This is the online student discussion forum for students who are currently enrolled in InterNACHI's free, online "How to Inspect for Moisture Intrusion" course. Students can pose questions, state opinions, make suggestions, and share images related to this course with other students. This thread will be monitored by the course instructor. For assistance with the course system, contact Ben Gromicko at ben@internachi.org. 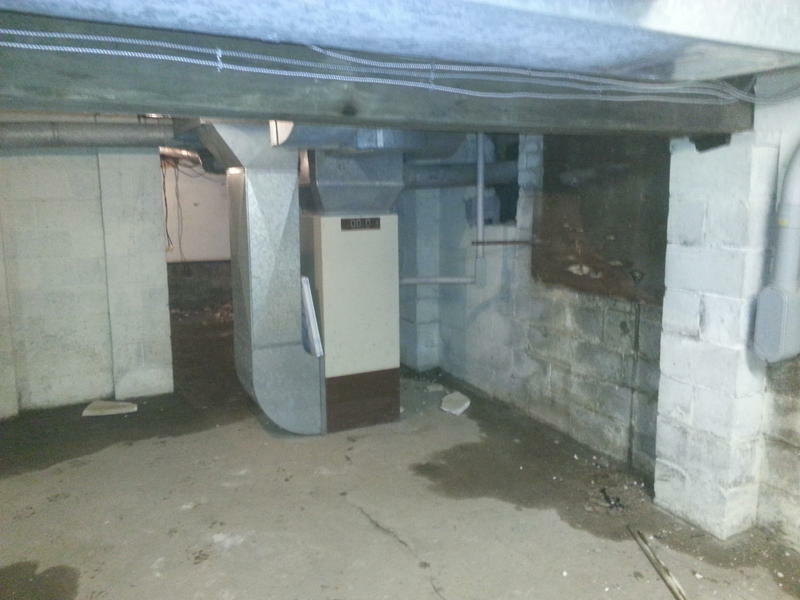 Here is a project that I recently handled for a moisture leak complaint. The leak led all the way from the 3rd floor to the basement. 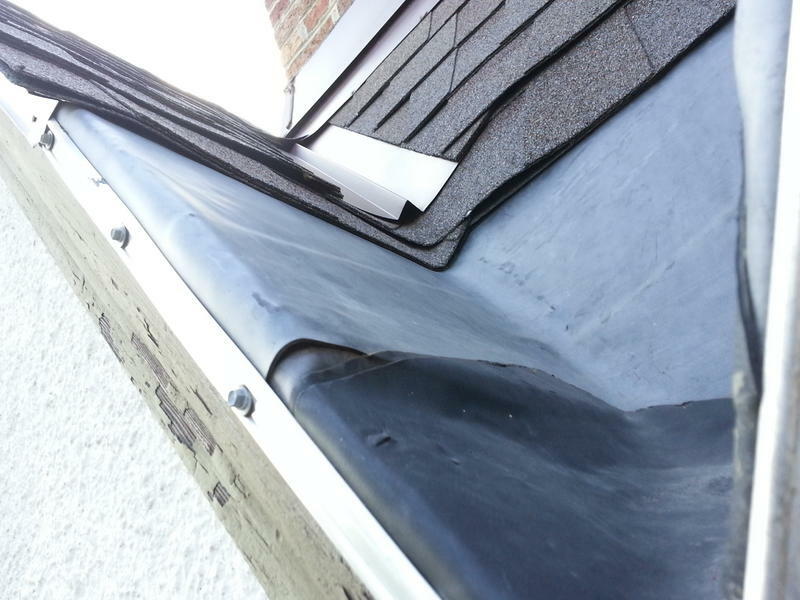 The two roofs came together and EPDM roofing was installed by the roofer. This is not a repair. It was done in this fashion as a new installation. It is clear to see that the overlap of the rubber membrane pieces breaks the rules of proper watershed. The bottom piece overlaps the top piece allowing water to funnel right under the material. 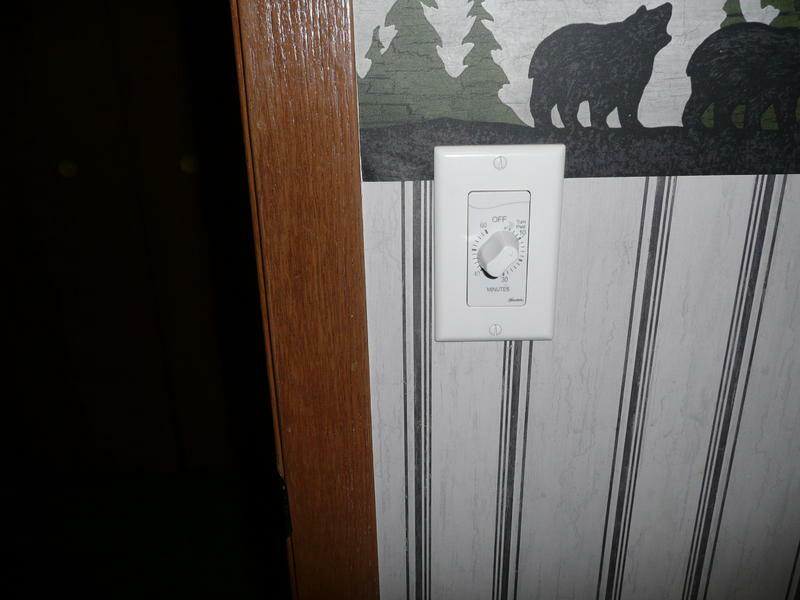 This photo was from a recent inspection. It was taken from the attic. The top of the rafter and adjacent osb sheathing is discolored. The moisture meter indicated a 20% moisture content. When I moved the insulation below this area, I found a large area that was very wet (see second photo). This area was where a wood-framed “chimney” intersected the roof. Unfortunately, I was not able to access the roof on this particular day due to ice and snow. However, due to the signs discovered in the attic, I was able to inform the client that there was an active leak of the chimney flashing and it would need to be repaired. From the attach picture it is obvious that there is multiple issues. Ground clearance, and water migration. 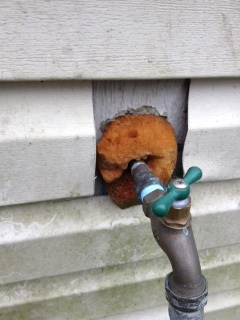 Here is a possible water intrusion problem. The way the vinyl siding was installed, with this opening around the hose bib not sealed will allow a large amount of moisture behind the siding. This is a case of severe ongoing perimeter foundation water seepage. The structure is a preserved historic building that was relocated onto a new foundation that penetrated too far into the seasonal water table. Second bathroom toilet has loose connection to floor drain due to impromper intallation. There is an absence of sealant at base of toilet. These problems could cause moisture and odor problems. The picture is of the inlets and outlets of an electric 220V water heater with solar heater plumbing. Clearly the connection on the cold water inlet is corroded and leaking. This is probably one of the most informative and important training courses that I have seen through InterNachi.....Great course! Attached are four pictures from the same house. At the time, we were in a terrible drought in northern CA, but December dropped 5 inches more rain than normal. Anyway, you can see the standing water in these photos. Aside from some erosion on the front yard that is not real visible in these pictures, there was no real damage to the house. However, they did need a drain system in the back and left side yard. The good news is one was already there for the gutters that they could tie in to. With a little bit of an extension for that gutter down closer to the street, they could have a very functional drainage system. The picture of the front yard shows the drain outlet and all the standing water around it; that is where the erosion took place, right next to the sidewalk in this picture. 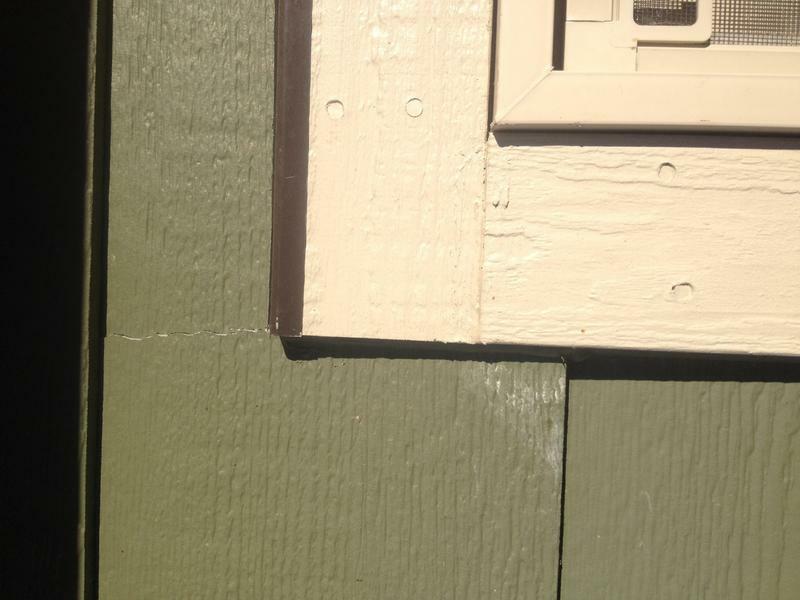 This is a picture of moisture intrusion through cracked siding. 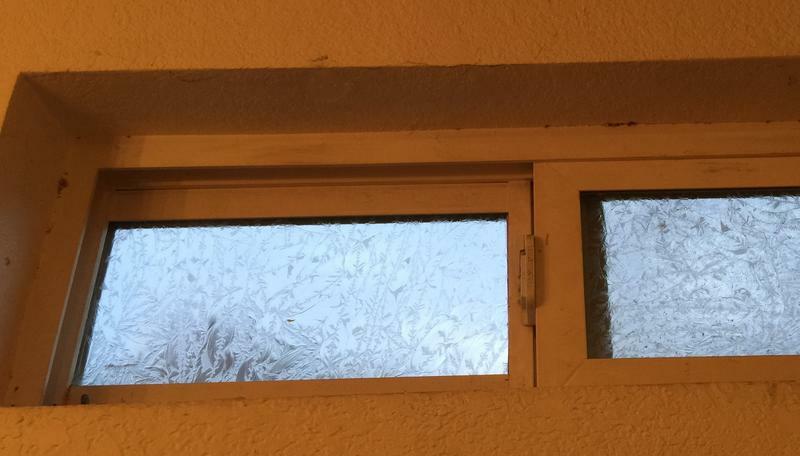 The window has been caulked and has Z metal. You can see the water evaporation on the bottom corner. This siding has moisture deterioration. Water damage at the tub/tile/wall junction. The problem appears to have been ongoing for some time, and an attempt to repair the wall is evident. The floor tiles have come lose, the drywall is damaged, framing member(s) are potentially damaged, the shower door frame is not properly caulked, the tile grout is failing at the tub, and mildew is present. 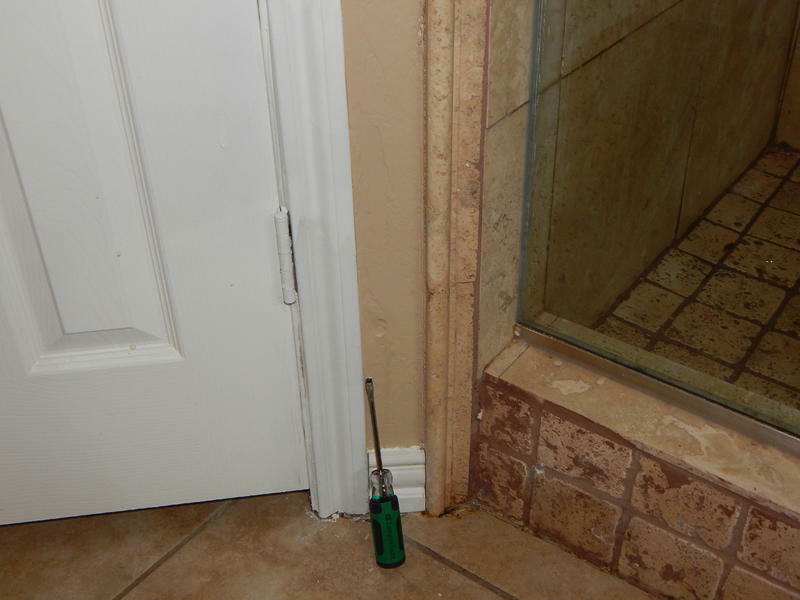 Here is a picture of some moisture damage to a bathroom wall and flooring. It is hard to tell in the photo, but there was damage to the drywall that had been painted over and looked fine to the naked eye. this image has three notable points regarding moisture intrusion.top:dryer vent housing is cracked/broken,allowing water to penetrate, and the top 2 of three louvered doors are being prevented from closing tightly, due to lint build-up.as housing is broken,would recommend replacement,otherwise cleaning would be sufficient.center:the crawl space vent doors are inoperable;the left side is built up with solidified debris and mud,while the right door has been replaced w/ cardboard and duct tape.would recommend the home-owner clean and confirm proper working of the left door,and consult local hardware/concrete supply companies and/or the internet to find a suitable replacement door or new vent unit.bottom:although the waterproofing of the foundation wall is clearly terminated above finished grade(4 inches),exceeding minimum requirements,these components are located on a northwest inside corner of a dwelling in southwest Montana.today as the snow melts,it is obvious that moisture has been absorbed into the foundation wall well above grade(6+ inches this time).not only is the waterproofing fading and flaking,there is the presents of algae forming on the deteriorating waterproofed area,but more noticeably above it. 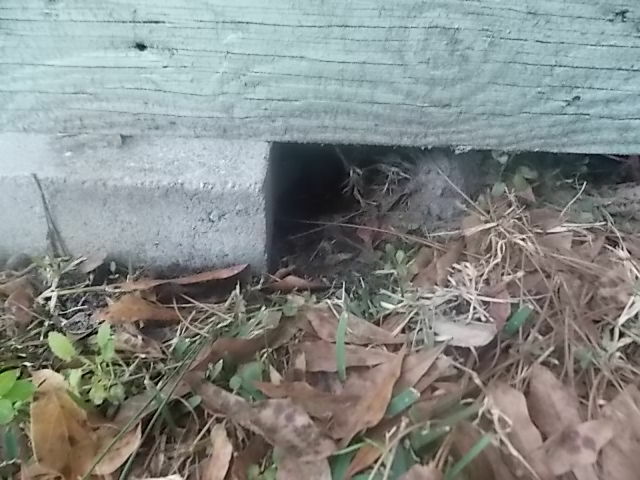 therefor,a working knowledge of the climate and weather,as well as the "always shaded" section of the dwelling should certainly have been taken into consideration during the construction phase of the foundation.would recommend re-applying waterproofing to or above average snow accumulation levels(with maybe an extra coat?). You can't really see it, but where the circle is, there is evidence that water is not properly draining away from the foundation. It is actually draining back towards the garage door. In the Roof Drainage, Gutters, and Downspouts section it states "Leaders should direct the downspout discharge a minimum of 2 feet away from the building perimeter." In a previous section on drainage it says that the minimum distance is 5 feet. Can someone explain this to me? Is it a typo? Thanks.